Will you be posting pictures of your new Clover? I’ll post a pic shortly. It look exactly like the Clover photo at CC. Patrick - great news on the Suttner! What will you do with your Morse when the Suttner arrives? If I stick with this, I can tell that I’ll outgrow this Clover eventually. Not sure what my next step will be. And Mike it was great to meet you at Noel’s workshop last week. Keep practicing with that lovely Edgley of yours! Congratulations on your upgrade to a Clover. I have got my Minstrel about two months later than you did, and my Minstrel still keeps me satisfied and entertained. It would be nice if you could share your initial sense of "change" between the two instruments. 1) The Clover has more refined bellows than the Minstrel. 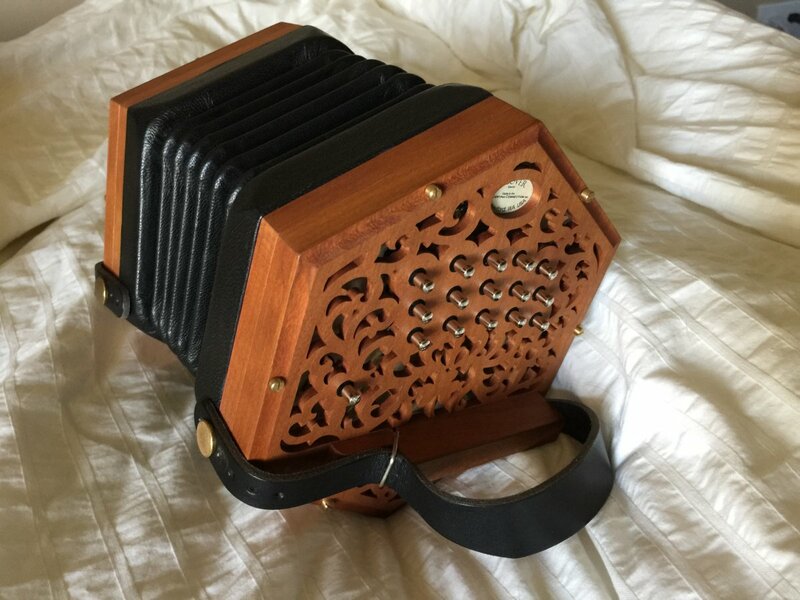 My Minstrel's bellows (and I bought mine new) were fairly stiff and were still 'breaking in' by the time I upgraded to the Clover. The Clover's bellows - even brand new - open and close with less effort than my partially broken in Minstrel's. And just looking at the construction of them it is evident that the Clover's bellows are better made. 2) The metal-capped buttons on the Clover are more comfortable on my fingers than the delrin buttons on the Minstrel. Also, the buttons on the Clover have felted sleeves on both the outer and inner plates of the instrument, so the action of the buttons is better than the Minstrel's - the overall mechanism of the buttons and valves seems to me a noticeable step up in the Clover. 3) Sound-wise, I think they are quite similar since both have accordion reeds. Both instruments seemed to improve their responsiveness with the first week or two of playing. In that respect I hope my new-ish Clover will keep opening up with continued practice and play. The overall difference between Minstrel and Clover isn't dramatic but it's noticeable. I expect that I will upgrade again someday - perhaps to a Wakker. I would need to play one first. I would hope that my next upgrade will be my last. Regarding the bellows, when I placed an order, Wim strongly recommended Wakker bellows option, and so did I. Having read your explanation, I am now more confident than before that I made a good decision. I think I will get along with my Minstrel for my lifetime. Felted sleeve! the action should be very smooth I would imagine. Hope you will have a good time with your Clover, and your old Minstrel will find a good owner! It just did! Thanks for breaking it in, I'll enjoy it. Glad to learn that it has a new owner, Connie!